The Astor West Urban Renewal Plan (see below) was adopted by the Astoria City Council on December 16, 2002. The Astor-West Urban Renewal District is located on the west side of Astoria, extending generally from Columbia Avenue west to Smith Point. 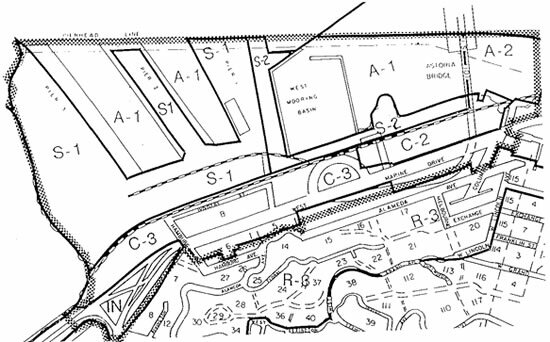 The area includes property with frontage on West Marine Drive and both land and aquatic area lying north of West Marine Drive (see map below). The renewal area contains 205.5 acres of land and water situated entirely within the City of Astoria. The primary objectives of the Astor-West Urban Renewal Plan are "to improve the physical conditions, functional relationships and visual quality of the area and to eliminate blight in order to create a climate more conducive for private development of property. The Astor-West Urban Renewal Plan will assist in meeting the Community's economic development objectives through redevelopment of key sites, assisting with the construction of needed public facilities, improving transportation and utility facilities in the renewal area, rehabilitation of older and historic structures, and creating public amenities." The maximum indebtedness of the Astor-West Urban Renewal Plan is $9,119,00. The maximum indebtedness is the total amount of funding that can be spent on programs, projects, and administration in the Urban Renewal District. Projects authorized in the Urban Renewal Plan include construction of the Astoria Conference Center, improvements to streets, curbs, sidewalks, trolley track, water, storm and sanitary sewers, and development and redevelopment assistance. Key projects undertaken in the District were construction of utility improvements adjacent to the Holiday Inn Express Hotel (204 W Marine Drive), extension of the River Trail through the Port of Astoria, the Red Building (20 Basin Street), and Maritime Memorial Park (10 Bay Street). The cornerstone project for the near future is the development of a facade improvement loan program. A number of projects have been completed in the URA since the time it was created. As a result, there is an opportunity to reconsider the future of the Astor West URA and how it can be a more effective tool for community revitalization, economic development, and redevelopment. With this in mind, the City Council established FY 15-16 goals to “Develop a Master Plan for the Western Entrance to Astoria” and “Promote Positive Economic Development Through Strengthening Partnerships.” For more information select this link: Astor West Urban Renewal Area Expansion.